While logged into BrightGauge, click on the green "+" on the top right hand corner of the screen and select "Gauge". Each gauge is built with data stored in a dataset(s) pulled in with your connected datasource(s). Different datasets pull in different data and fields, such as ticketing information, time entry information, machine information, etc. and with custom datasources and datasets, the possibilities are endless. Apart from the data itself, datasets also have different configurations such as how far back in time the data is pulled from and how often they refresh. Once the desired dataset has been chosen, click on the blue "Continue" button on the bottom right hand corner to move on. If you're working with an already built gauge, you may change the dataset by clicking the tab for the gauge layer you'd like to update. The first section of the Gauge Builder is the "Data" settings page. Here you will configure what makes the gauge actually function, the data components. Depending on the chart type, there are different components that make up the inner workings and configuration of the gauges. When first selecting a chart type for a new gauge, a brief explanation is illustrated on where the key components( measure, dimensions, and filters) appear on the chosen gauge type. These different components are explained in further detail below. Available to our Enterprise users, snapshots allow you to capture a datapoint and track it over line chart for your preferred period of time: daily, weekly, or monthly. You cannot use drilldown or filter snapshot gauges. For more information on Snapshots, read this article. To configure each of the three parts mentioned above, in the Gauge Builder simply drag and drop a field from the list on the left hand side, to the desired slots on the top of the page: measure, dimensions, and/or filter. Please feel free to refer to this short video. Note that each field has a symbol that identifies what kind of field it is (Text, Number, Date, or Boolean). Funnel, Number, and Progress Gauges only require a Measure and Filters since they display only one number or value, so there is no function for Dimensions which are what group (or pivot) the data in gauges with axis. In creating a funnel gauge, you will need to create multiple layers filtering for the data you wish to measure for. The order of layers dictates how your gauge will show from top to bottom. Sometimes viewing the raw data is just what you need. This is possible using the List Gauge chart type, which allows you to simply choose the fields you need and list them exactly as they appear in the database. Once you've configured the Data Settings for your gauge, you can give it a more personalized feel by configuring its Design Settings. In this section, you see a list of all the fields being used in the gauge under their original names (or labels) as they appear in the database, along with the kind of field they are (number, text, date, or boolean). Here, you may rename or reformat these for display. Table and List Gauges use these fields as column headers. Layered gauges create series that are also displayed in these fields. The names of these fields can then appear in the gauge's Legend and/or Tool Tip. The labels for these fields can all be edited by simply clicking on them. Apart from changing the labels for Number fields, the number formatting itself can also be edited. Unless it's a percentage, more often than not you'll need to apply two decimal points. Whether if it is to include decimals, computer notations, or percentages, we have multiple number formats to fit your needs. For more detailed information on how to configure number formatting, please refer to this article. Highlight a gauge with color thresholds showing when you're within or out of reach of a goal range. To set a threshold, go to the design settings and click on the field you would like to set a threshold for. Please note that Tables, Bar Charts, Column Charts, and Lists support thresholds for both of the field types above, Number and Progress Gauges support only number fields, and Pie Charts only support text fields. Tooltip Display - Available for Column, Line, and Bar charts, this is a label, or "tip", that is available to help view and interpret specific values on graphs easier. By default the Tooltip will show the X and Y values for a specific category/section, but this can be edited using the text box in the popover. There are available tokens that can be used to format the Tooltip. A neat formatting command that can be used in this text box is the "bolding" feature, to outline certain parts of the tooltip. To bold text or tokens, simply wrap them with 4 asterisks, two before it and two after it. The Tooltip feature can be toggled to be visible "Always" or "On Hover" over values. An example of editing the tooltip, including changing the tokens, is shown below. In this dual dimension gauge we might want to view each section of a bar (or series name) broken down individually, rather than the information for the bar as a whole. Label Format - Available for Pie charts, this serves the same function as the "Tooltip Display" explained above, but with slight differences. Show Legend - Available for Column, Line, Bar, and Pie charts, a legend is available to help view and interpret sections/groups on graphs easier. By default this feature is turned off, but can be toggled on with a simple click. Sort - To sort the data in a gauge, click on the "Sort" option, select the field you would like to sort by and whether you'd like to sort in Ascending or Descending order. Description - Customizable for all gauges, this section is designed to include a brief description about the purpose/configuration of the gauge. To include a description for a gauge, click on the description option, enter the desired text into the text box, and click "Apply". The description can be viewed on dashboards or the gauge list, by clicking on the "i" icon next to the gauge titles and also by hovering over the gauges list when editing a dashboard or report. Limit - When representing data in any of our gauges (with the exception of number gauges), it is sometimes useful to limit the data in a certain manner. Selecting a limit, determines the numbers of results that a gauge will show. For example, combining this limit setting along with the sort option, we can create a metrics such as "25 Most Installed Applications" or "Top 10 Active Clients". Configurable for Column, Line, and Bar Charts, this section allows you to edit the axes settings including the labels and scale. -A text box that allows you to edit the "Minimum" number displayed on the scale. This number is initially determined automatically depending on the values being displayed on the graph, but you are given the option to edit this to best fit your needs. -A text box that allows you to edit the "Maximum" number displayed on the scale. This number is initially not configured (meaning there is no limit on the scale), but you are given the option to edit this to best fit your needs. -A text box that allows you to edit the "Interval" in which the scale is counting by. This number is initially determined automatically depending on the values being displayed on the graph, but you are given the option to edit this to best fit your needs. Available to our Enterprise users, embeddable gauges allow you to take any gauge, mark it as publicly viewable, and insert on a webpage with a short snippet of code. If you disable an embedded gauge it'll show an error where it's embedded. To set a gauge to public, go to the Gauge Builder for that gauge. Under the Design section, select where it says "Public", toggle it to on, and "Copy" and " Paste and Match Style" into the body section of whichever part of the page you'd like to add it on. When viewing a gauge, you can view a breakdown of the data that makes up the metric through the drilldown. The Drilldown allows you to configure a "list" that pops up when clicking a value on a gauge. By default this feature is not activated on gauges, but can easily be configured for all gauge types (with the exception of List gauges). To access the Drilldown settings page, in the gauge builder, click on the "Drilldown" option under the BrightGauge logo on the top left of the screen. 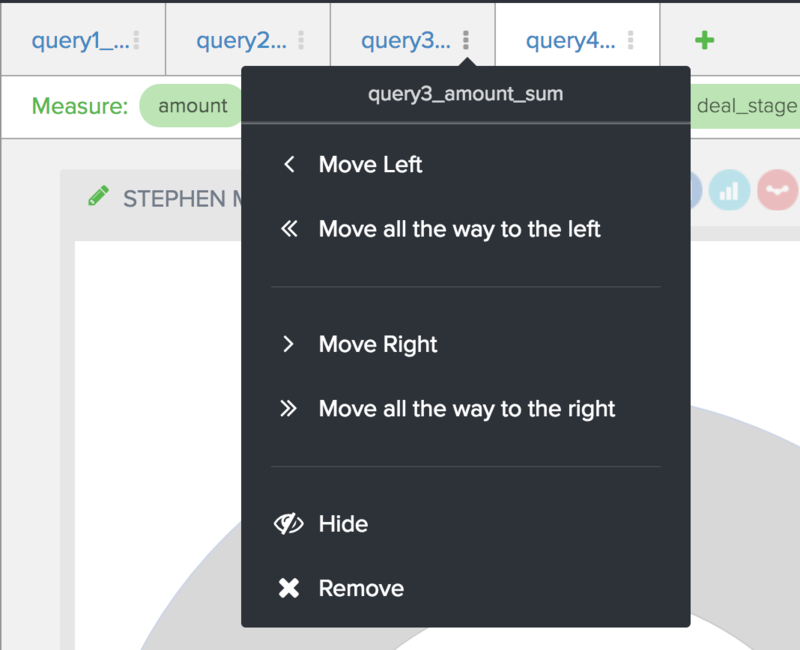 To configure the "Columns" to be displayed in the Drilldown, simply drag and drop the desired fields from the list on the left hand side, to the "Columns" bar on the top of page. As the fields are dropped in the "Columns" sections, you are prompted with a popover that allows you to edit the field name as to how you would like it to appear on the column header. Curious to know if a gauge is being used somewhere? The "Usage" tab highlights where exactly in the app a gauge is being used. If you click on one of the links, it will take you to that section of the app where the gauge is being used in a new tab. This is for the multitaskers! If you want to rearrange the order of your gauge layers, quickly sort via the layer dropdown. Is there a way to format how a text column displays? We have a report we run where clients respond to surveys. Sometimes they leave comments, but sometimes they just give a score. We would like "null" to display as whitespace, but need those results to still show in the gauge. It would help if this information was more current. The screenshots must be showing info from an older version, I don't have "Advanced Settings", mine says "Usage". I'm looking for the instructions on how to configure conditionals, but they don't seem to function the same way as they used to.